Vincent Isore/ IP3/ Getty Images. This week, Facebook received some tough questions from the companies that advertise on its platform regarding their potential involvement in the Cambridge Analytica scandal. Advertising has long made up the bulk of Facebook’s revenue, and as companies express their mistrust of the social media site, Facebook has attempted to increase its transparency. As this chart by Statista shows, Facebook accounts for a significant share of the online advertising revenue worldwide. 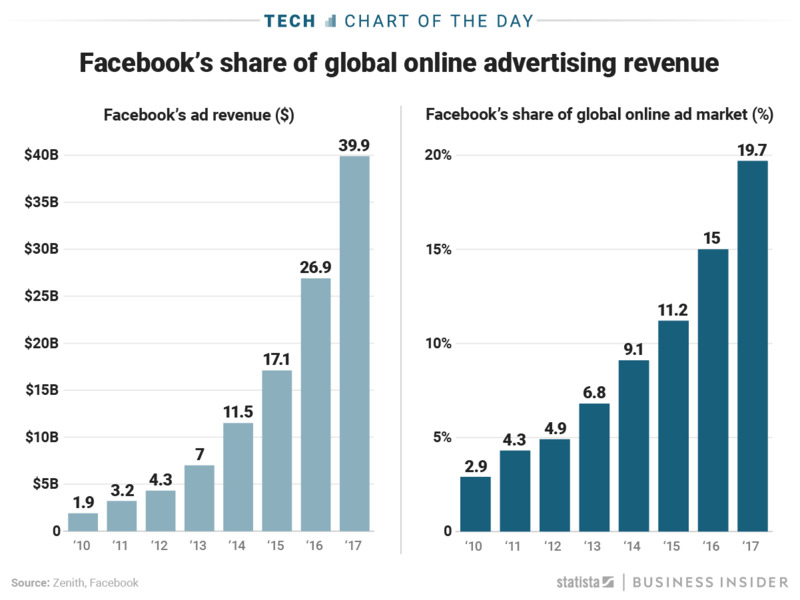 Since the company introduced ads on its site in 2004, Facebook has experienced a steady incline in advertising revenue, and now, it accounts for 20% of the $US203 billion global advertising online marketplace.